Now that we’re moved in, we can’t rest on our laurels (which, I hear, aren’t even really that comfortable anyway). The big ole loan we took out to get to this point has come due and the bank wants us to either pay it off or refinance it into a new mortgage. We’re shooting for the latter but first need to finish the siding and the deck. 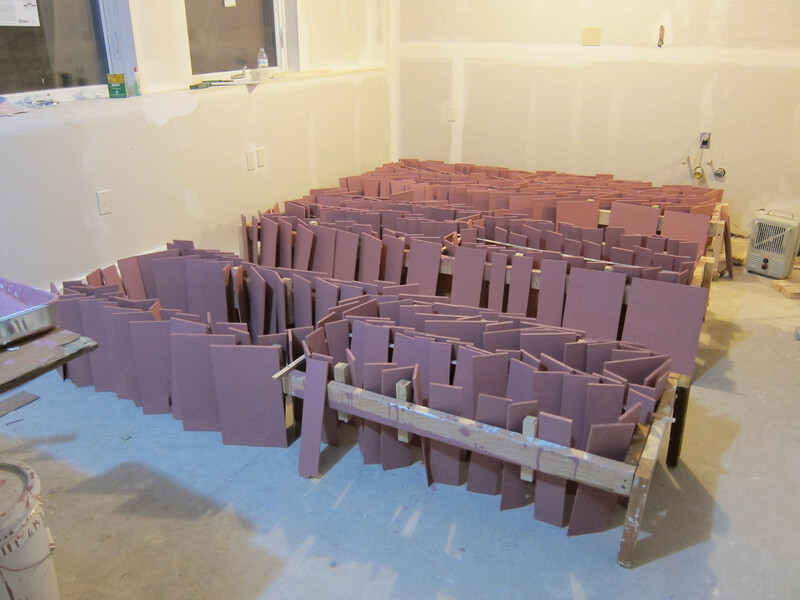 Our original plan was to side the house like it was before the fire, using cedar shingles. 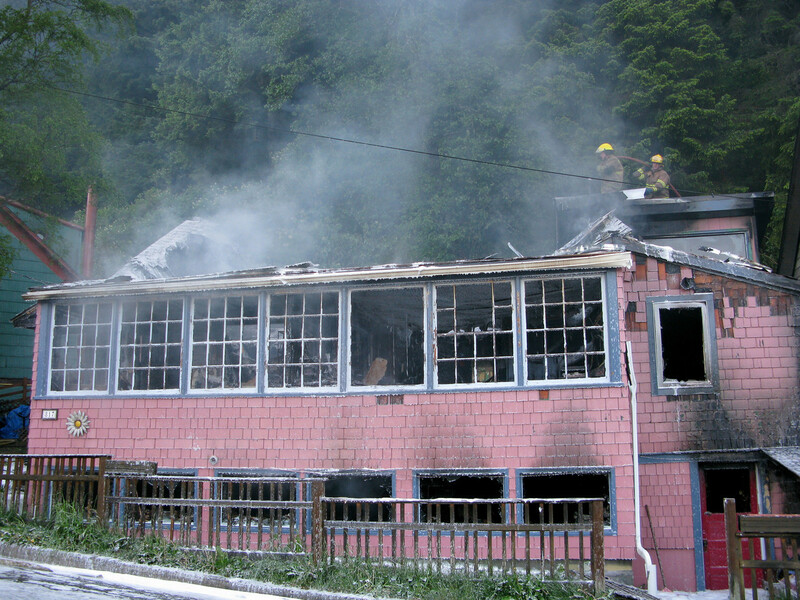 I suppose we were so driven and determined in the months following the fire, while we were planning the new house, that no one tried to talk us out of something so labor intensive. Cedar shingles are about the size of a really tall paperback book. They’re tapered to one end, and when installed overlap each other like a suit of armor. Each one is painted by hand. First, with a good coat of stinky oil-based primer and then with the lovely latex-based Rose Lyrical, aka Ashes of Rose, aka Pink. We bought a whole pallet of shingles (thousands) and Laura and her Team Of Awesome powered through priming and pinkifying them all. 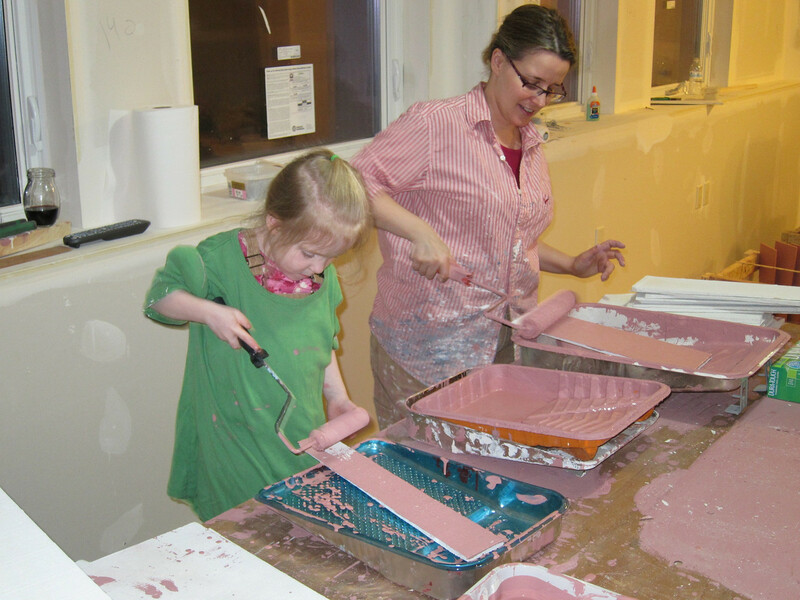 Since the latex-based paint doesn’t require a respirator, Meadow was eager to dig in on some pink too. At some point our homage to the original was outweighed by reality and we realized that siding the *entire* house in shingles was out of the question. 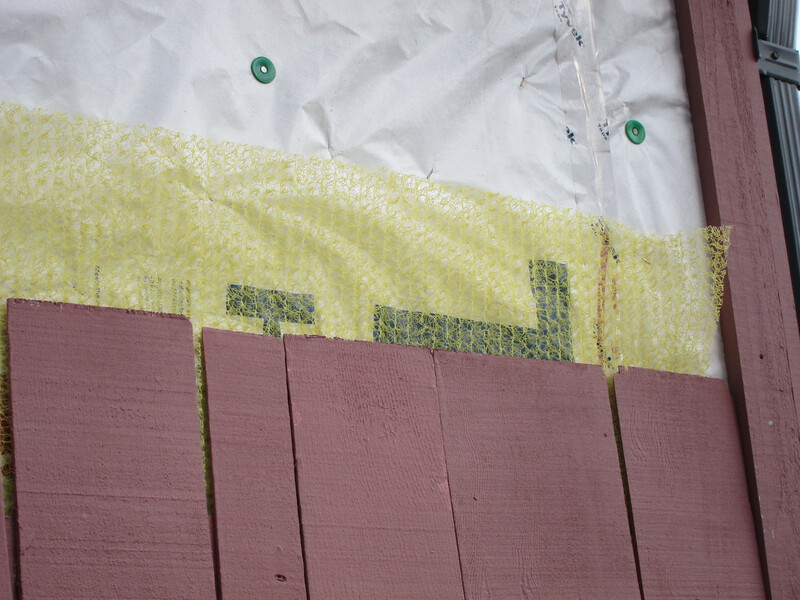 So, for the “non-visible” façades, we went with “Hardie panel” — easy to paint, easy to install, and made of cement so doesn’t burn very well (also of note: the walls facing the tiny walkway between houses has about 5″ inches of drywall). 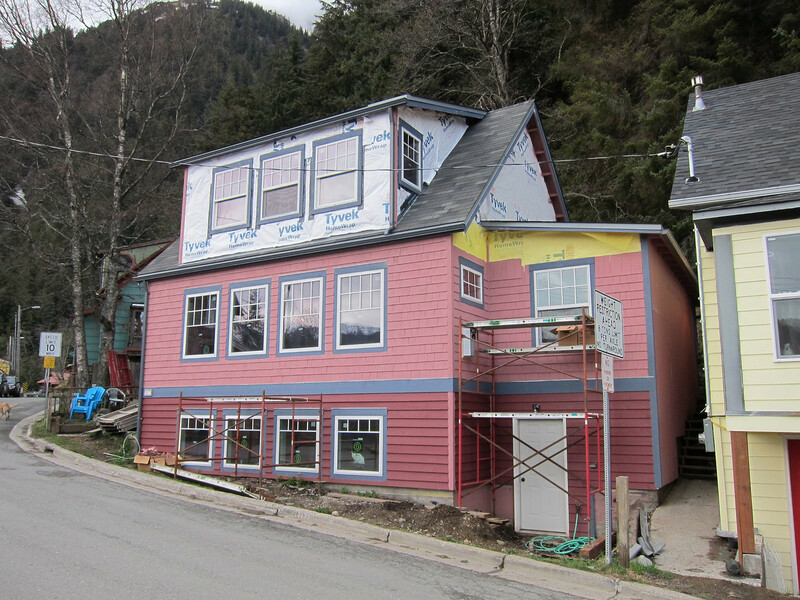 The vertical geometry of the new house gave Laura some room for design, so she decided to do a horizontal belly-band all around the house, and use a different color for siding below. We also used a different style of siding for this: long cedar planks with a taper about the same as the shingles. 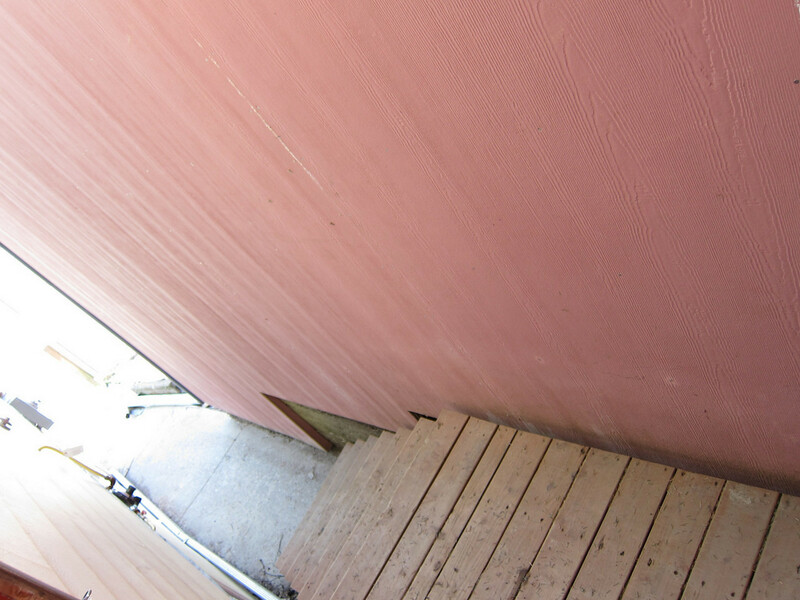 These long boards not only take less time to paint and install than shingles — they take 10X less time. Here’s Rob and Tyler going at it. 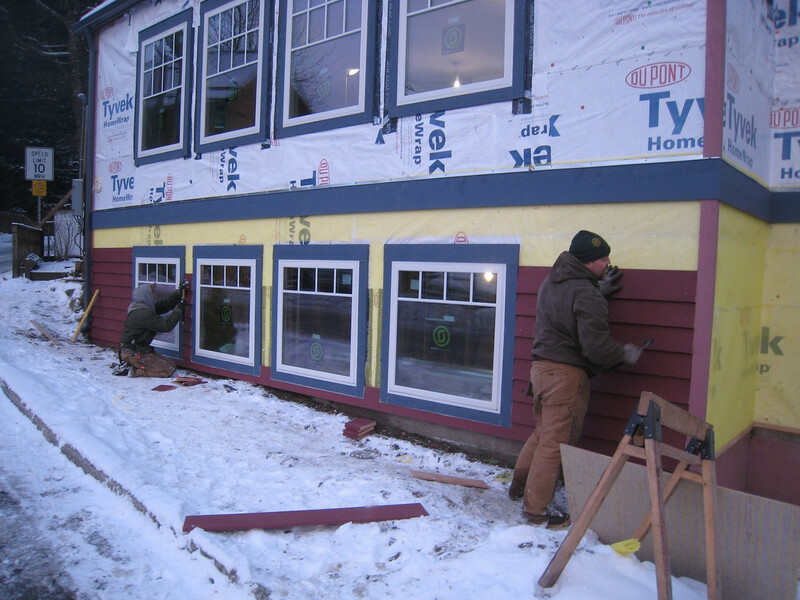 Siding the house isn’t just a matter of selecting a siding and putting it on. It’s a system of materials that work together to make an impenetrable barrier that moisture/air can escape from. The first layer of the armor is an inch of plywood attached to the framing. On top of that is Tyvek HomeWrap, which I think of as a Goretex rain coat. On top of the Tyvek is Home Slicker Rainscreen, which is basically a heavy plastic mesh that creates an air gap between the cedar and the Tyvek so moisture and air have a channel to drain/evaporate. After weeks of shingle priming and painting, the weather cleared and installation began. As luck would have it, we ran out. All that work got us enough shingles to cover only the main floor. We won’t be buying and painstakingly painting more shingles for the upper level. 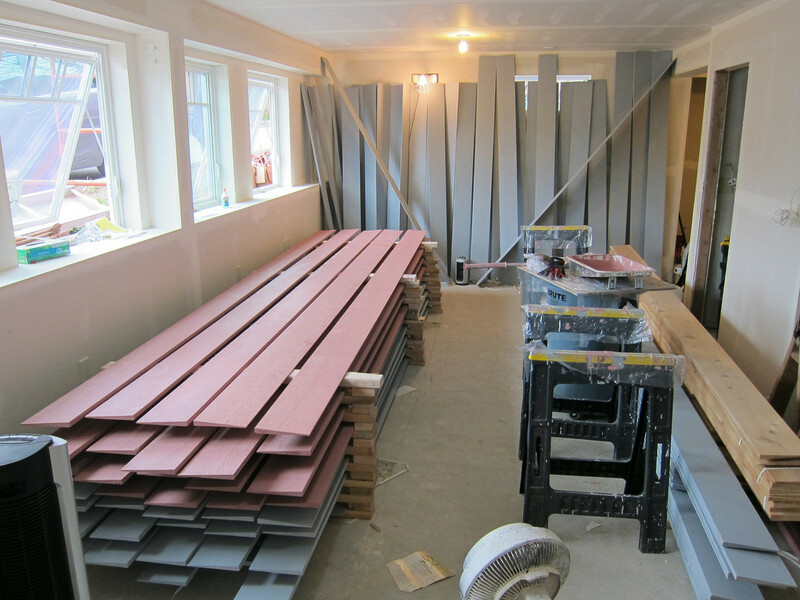 Instead we’ll use the long cedar planks like below the belly-band, only in pink instead of plum. So what did we spend mother’s day weekend doing? You got it! Stay tuned a couple weeks we should have the whole house sided and will get to start on the deck, and then after that: refinance. « Moving, and 5 Features of Our New House that I Love.